Uncle Sam is so generous, giving away so much of its very own treasure that it earned from its very own hard work creating so much value that we all wanted to pay them for. Here is a short list of our Christmas gifts this year from the various segments of the government. Automated Radio Controlled Drone. Warning: a military tribunal in Guatanamo bay is investigating the occasional accidental demolition of wedding parties. Cheap Health Insurance for Everyone. Warning: No Customer Service yet available. FCC is investigating allegations of false advertising and SEC is investigating allegations of Fraud in the Inducement. Free telecommunications monitoring, including free subscription to full email, bank, and internet logging of all your activities. Investigation by Congress is now complete and the NSA has been granted full leave to continue to supply this service to all Americans, so there is no fear of losing service. The gift of higher taxes. IRS has greatly expanded the availability of personnel to assure that this gift is delivered not just to the rich, but to the middle class too! Merry Christmas! Warning: just like eating a plate full of worms as your dinner in Guinea is mandatory to avoid insulting your hosts, so the IRS will feel insulted if you don’t accept their gifts. The gift of money. The Federal Reserve is giving away 75-85 billion dollars a month of brand new crisp currency! How generous! Mostly this has gone to Wall Street—because they are on Santa’s nice list—but it trickles down to some of the other politically-connected folk who have gotten a very Merry Christmas from it. The gift of housing. The Federal Reserve is buying the deeds for 250,000 homes each month through mortgage-backed securities. When the economy goes bust next, the Fed will own millions of homes! Then the Fed will generously rent those homes out to us, and we can pay the Fed a monthly rent to have housing. Yay! (That the Fed has bought all those home deeds with money they just created out of thin air should be noted, but that won’t affect the reality that they will own the houses, and we will have to pay them rent with money that we make from real work!) Merry Christmas future renters! The gift of inflating the currency. It is important to inflate the currency so that the Christmas gifts could all be given to Wall Street and so that the National Government could continue to have unlimited power and wealth despite being bankrupt. As the biggest debtor in the history of the world, the US Government is the biggest beneficiary of money printing, low interest rates, and inflation. Merry Christmas Wall Street-Government Monetary Complex! The gift of an increasingly strong central government. What would we do without the US Government having power over its people? We might not buy the financial products that they want us to buy, like health insurance to make health care even more of a mess. We might not agree to screwing in toxic mercury-based lightbulbs at 20X the cost of the incandescent bulbs the government banned. We might not agree to have ethanol in our gasoline to destroy our engines, cut our fuel mileage and effectively dump even more CO2 into the atmosphere because of all the petrofuel that gets used to make ethanol. Merry Christmas Big Agribusiness and lightbulb manufacturers and health insurance companies! The gift of the government’s food pyramid that made all government schools feed the children large amount of carbohydrates instead of healthier fats and proteins, thus making the kids fat. Jolly old St. Nick was fat too, so Merry Christmas! The gift of a thriving and busy economy in and around Washington DC! Merry Christmas Virginia and Maryland suburbs! When the Roman Empire began collapsing in the west, Rome stayed rich until near the end as they sucked the other regions completely dry. (In the end the barbarians came to Rome, of course). So Merry Christmas Washington, DC! No barbarians yet! And one more gift from the US Government, and this is a real gift. With the long-time misbehavior in Washington somehow increasing beyond what the last guy did, more and more Americans have become aware of the illicit and counterproductive activities of a city populated by politicians of both parties, all of whom eagerly inflate the economic bubble and pilfer the results of the labor of the citizen, putting all that wealth into the hands of people who haven’t earned it. Merry Christmas to all those who have so far awoken to what’s going on. Merry Christmas one and all! May the New Year bring us even more gifts!!! 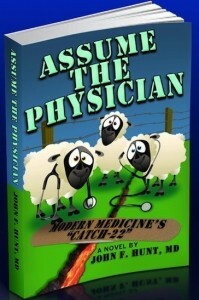 John Hunt, MD is the author of Assume the Physician. Just like Obamacare, Assume the Physician will make you laugh until it hurts. This entry was posted in Constitution, Health Care and tagged Assume the Physician, Audit the Fed, catastrophic insurance, Catch-22, Eddie Marcus MD, Fed, Federal Reserve, health care, Higher Cause, House of God, John F. Hunt, Laissez Faire Books, obamacare, tragedy, US Constitution. Bookmark the permalink.